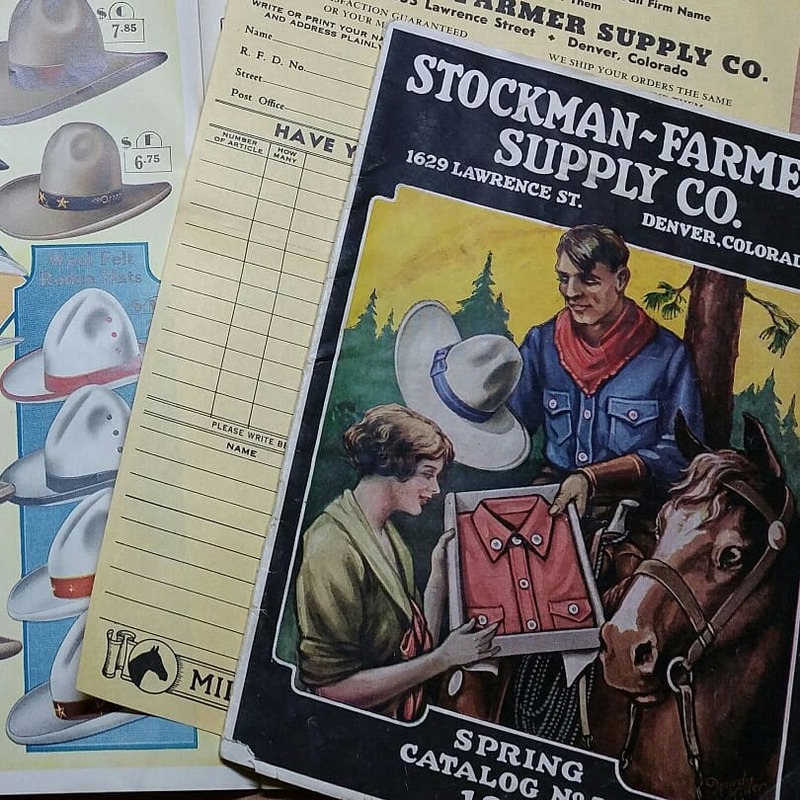 STOCKMAN FARMER SUPPLY CO. was born in 1919 just 100 years ago. The unique characteristic of the Western golden age has not changed despite the passing years. Congratulations Mr. Phillip Miller. We think that you see it almost in the same way, but the shape of the overlays is different in the size, the design and the quantity of spots depending on original product makers. So we're based on the specification every manufacturer and it's being made. The point that an outline of an overlays and a line of spots are offset also one of the delicious of the vintage specification. Each is the small specification, but these produce the peculiar atmosphere by becoming an aggregate. Reproduction of the NOVELTY BELT No.366 made by ACE WESTERN BELTS. 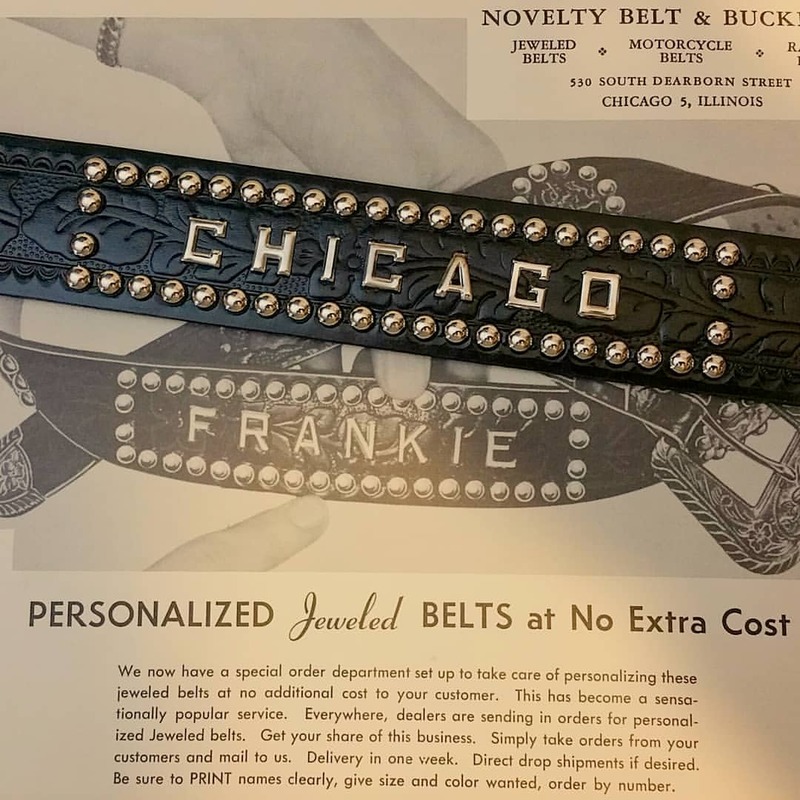 We reproduced emboss design, shape and finish from the 1940s original belt, and Alphabet spots are made by original vintage press mold. 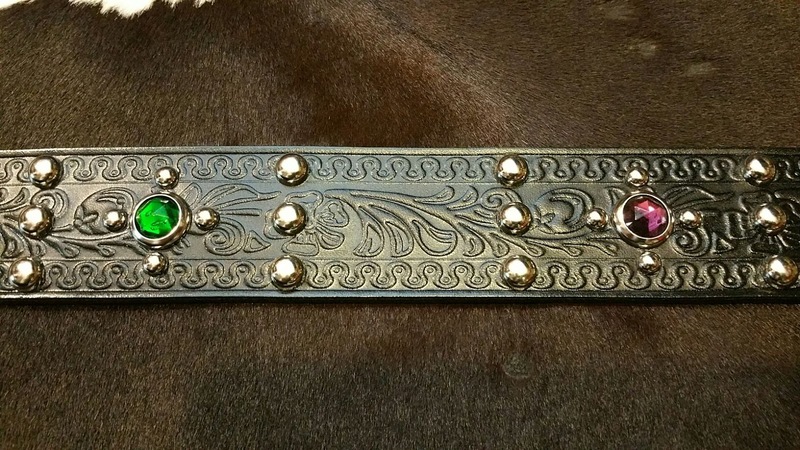 Reproduction of a studded jeweled neckerchief slide made by Denver. We reproduced shape and finish from the 1950s original slide. 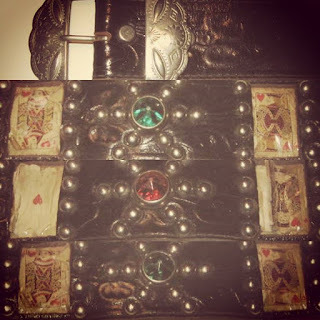 A jewel is made by original vintage press mold, and jewel ring is an old specification too. We made studded skinny belt for 706union . 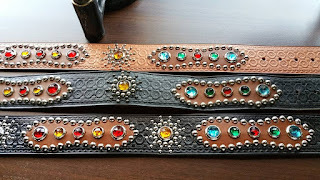 They are very attractive 1950's style western dress belts. Those each part are painstakingly made to be as near as possible to the original specification. 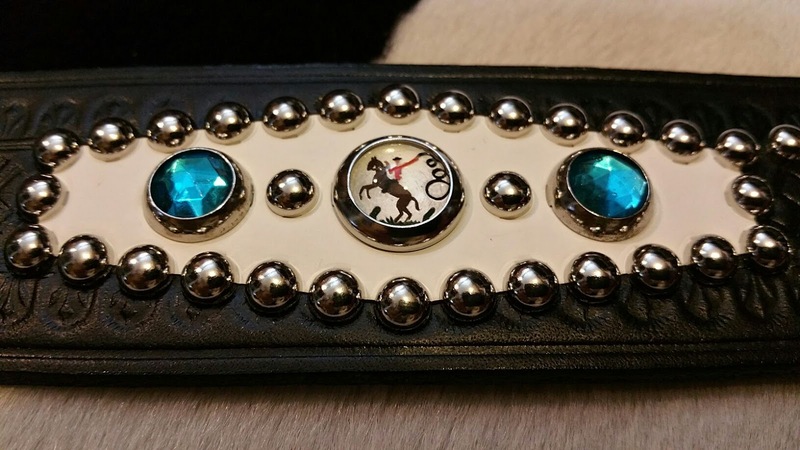 A longhorn buckle and a jewel ring is NOS. 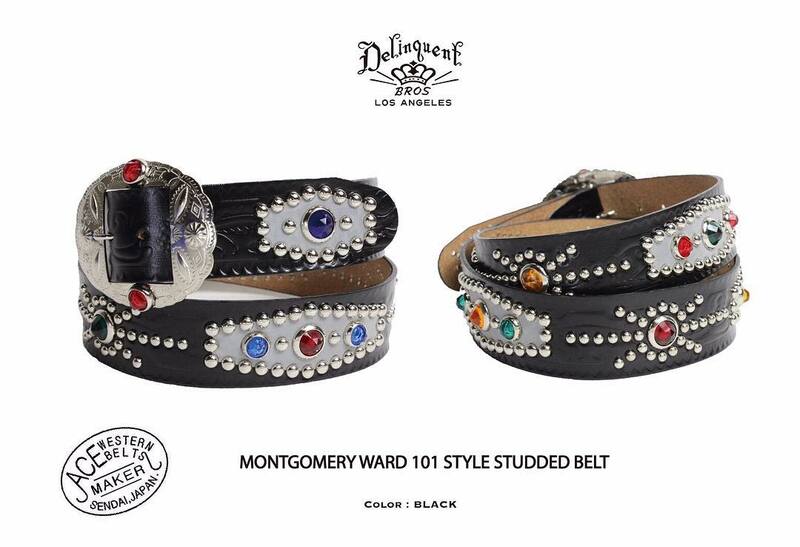 They are only sold by 706union . I hope you will enjoy it!!! Reservation order is being accepted now. 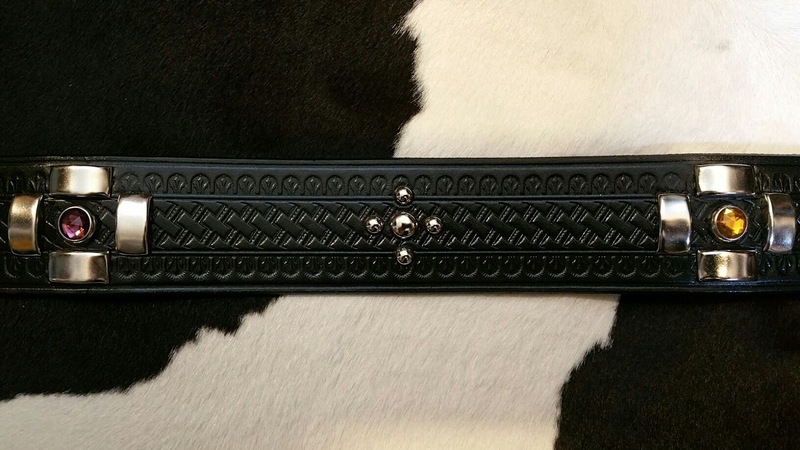 We made studded belt for Attractions. 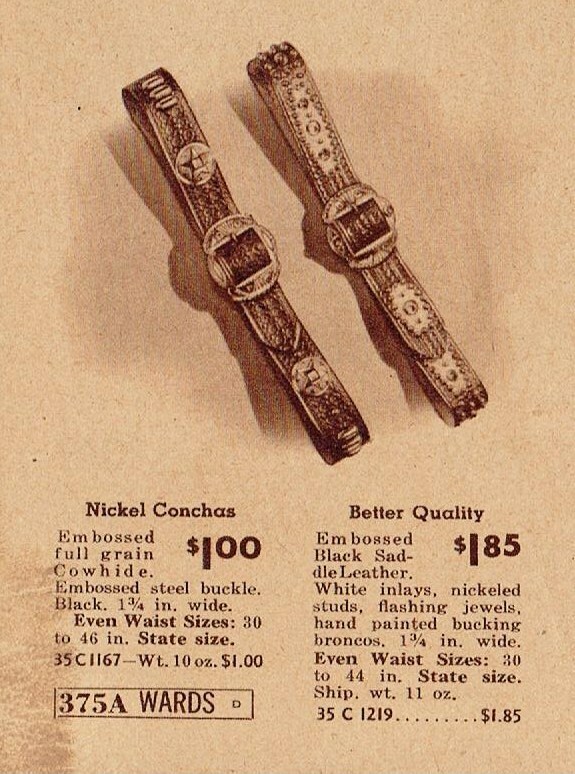 They are very attractive 1940's east coast style western dress items. Those each part are painstakingly made to be as near as possible to the original specification. A jewel ring is NOS. They are only sold by @attractions.official and Attractions dealers. 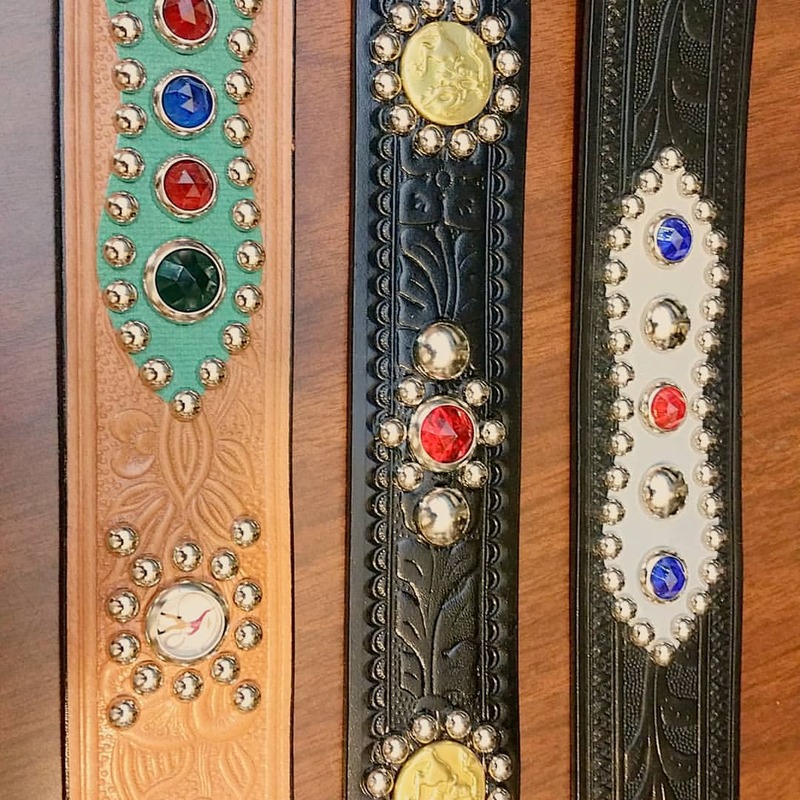 They are very attractive 1930's western style dress belts. 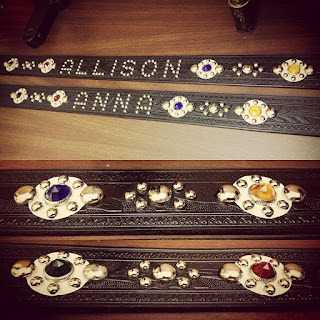 Reproduction belts are painstakingly made to be as near as possible to the originals owned by mine that were. So buckle is a press mold solid steel like vintage. They are only sold by DAPPER'S dealers. 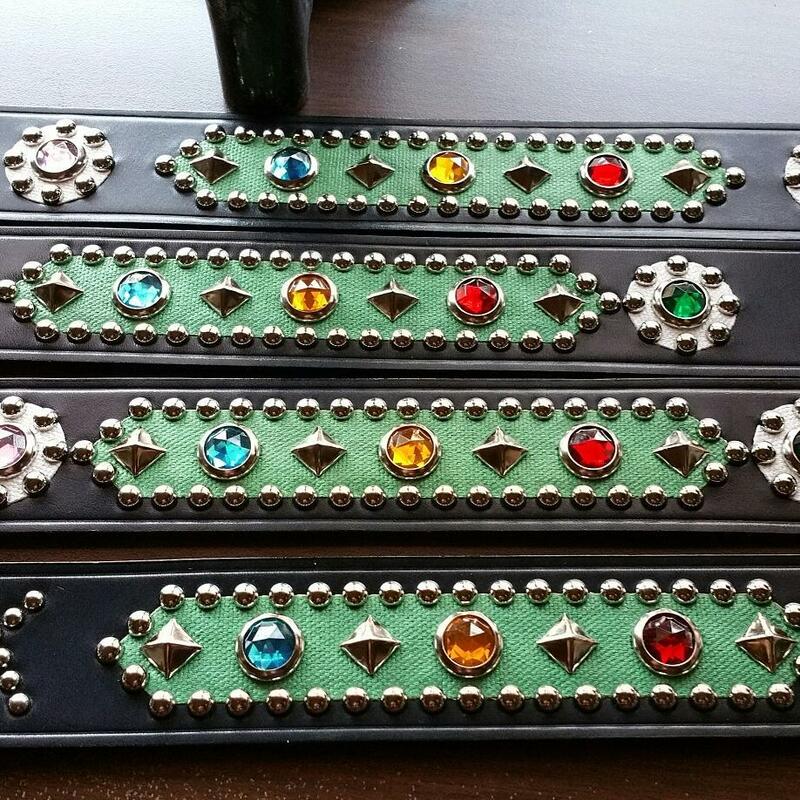 Luminous with over 240 studs and jewels. 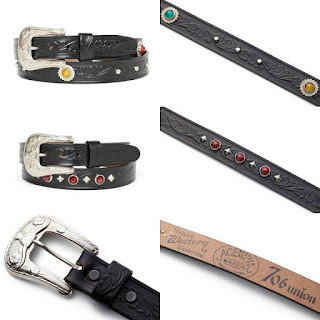 1 1/2 inches genuine leather belt with Attractive emboss design. 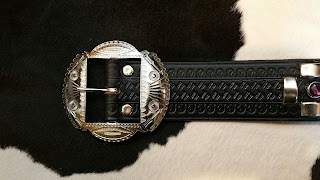 Oversize solid steel buckle. Plus, luminous background behind studs so that studs SHINE IN THE DARK like a 1950's original. 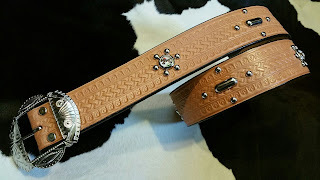 The 1940's east coast style dress belt and wrist cuff. Also the spot decoration for engineer boots. We made these it for Attractions 2017 AW Leather collection. 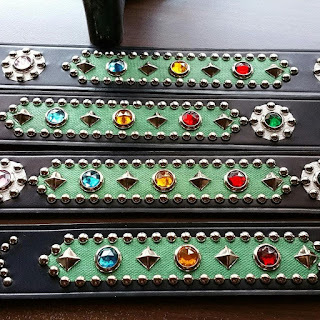 These are very attractive items, and only sold by Attractions and their dealers. 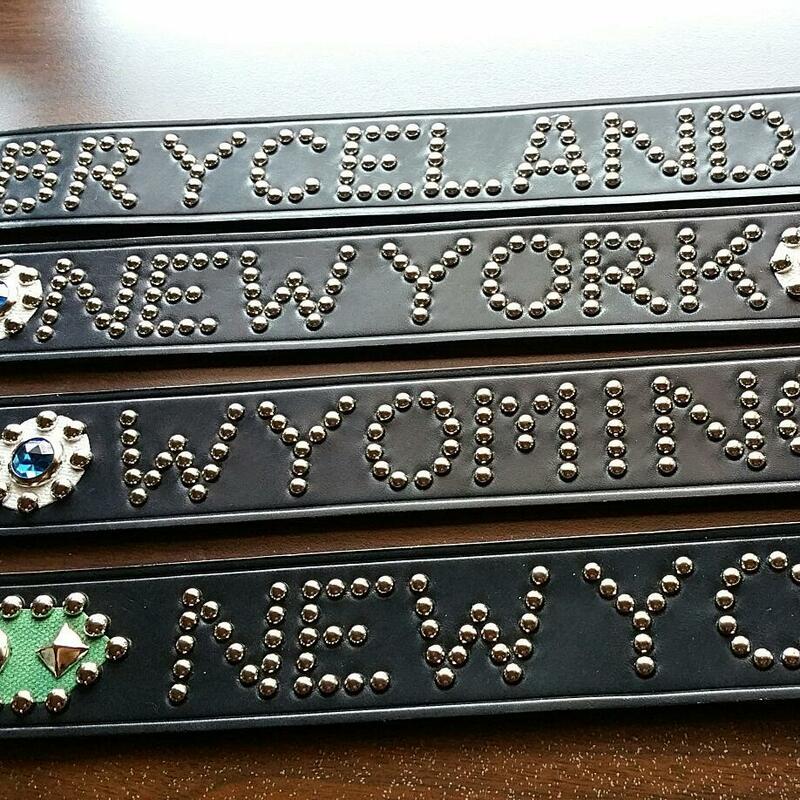 We made these reproduction belts for Bryceland's Co. They are very attractive 1930's east coast style dress belts. 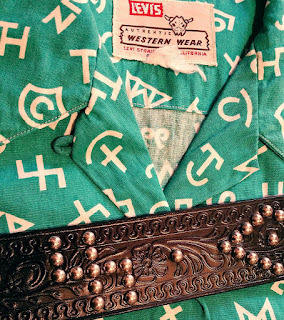 A general east coast style dress belt has a double tongue buckle, but an original belt of owned by Ethandesu is a rare single tongue buckle. Also a form of alphabet also has the feature of the east coast. 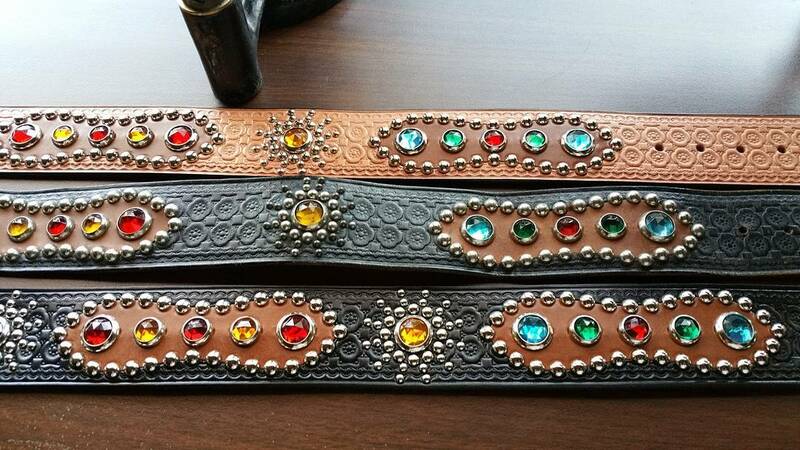 Reproduction belts are painstakingly made to be as near as possible to the originals owned by Ethandesu that were. 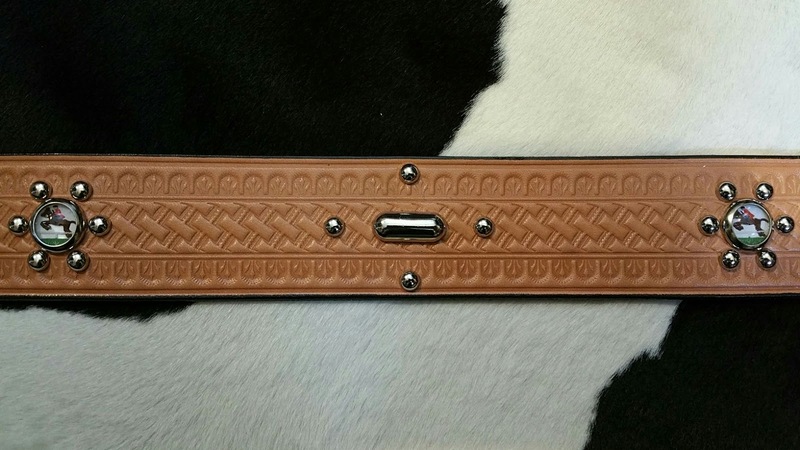 So buckle is a press mold solid steel like vintage. 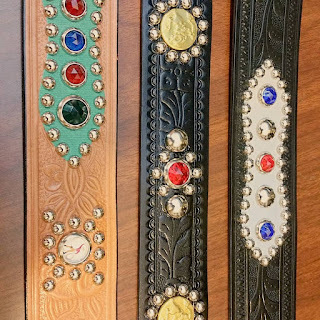 They are only sold by Bryceland's Co. Sewing by Libertaria Works. 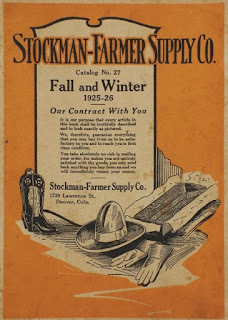 Stockman farmer supply Co. No.955 in 1930's. Miller stockman supply Co. No.2070 in 1950's. 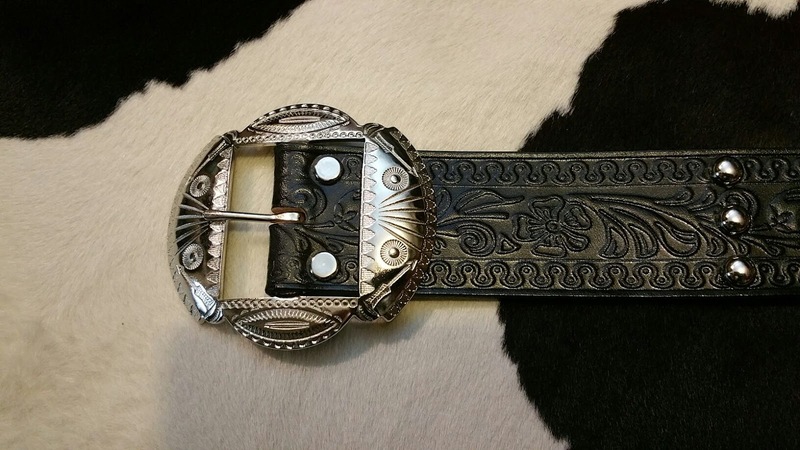 The buckle is original 1940's press molded solid steel. 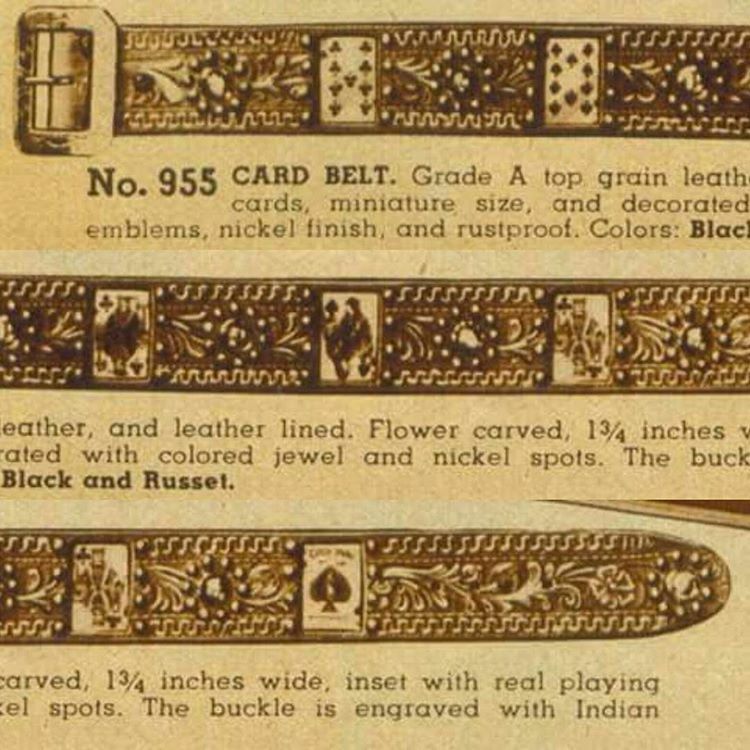 The buckle which has taken over from the maker which was making studded dress belt in a Western golden age. Comparison with the original. The center is original 1930's. 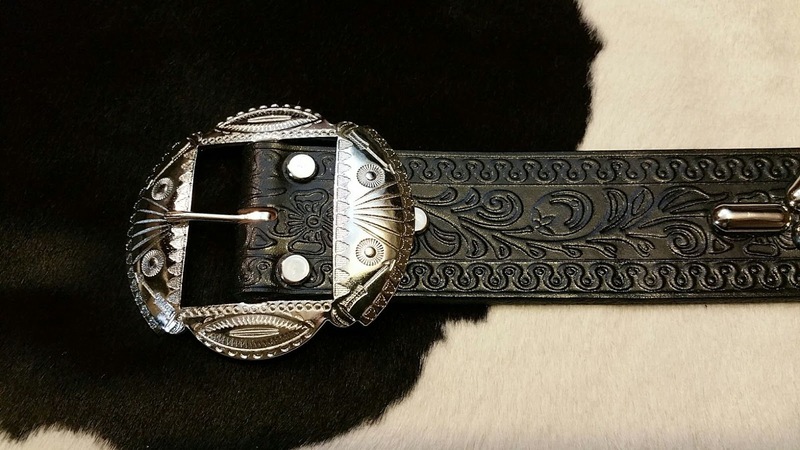 The late 1930's emboss design is the characteristic of this belt. 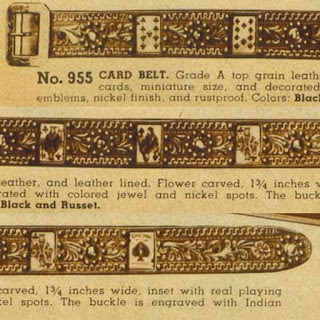 INDIAN DESIGN BUCKLE was born in 1936 just 80 years ago. We are glad to be able to announce a reproduction model by INDIAN DESIGN BUCKLE in 2016. Buckles are made of solid steel, press molded, nickel plated, stamped in the traditional Navajo design. This buckle that born in 1936 was designed by a tentative name POD company (The company name is private for some reasons), and played an active part as face of various western belts. 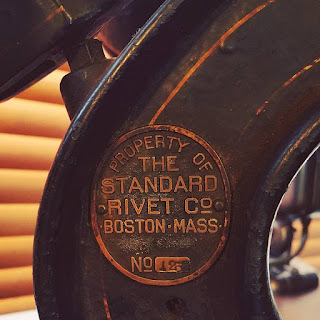 Made by North & Judd MFG. 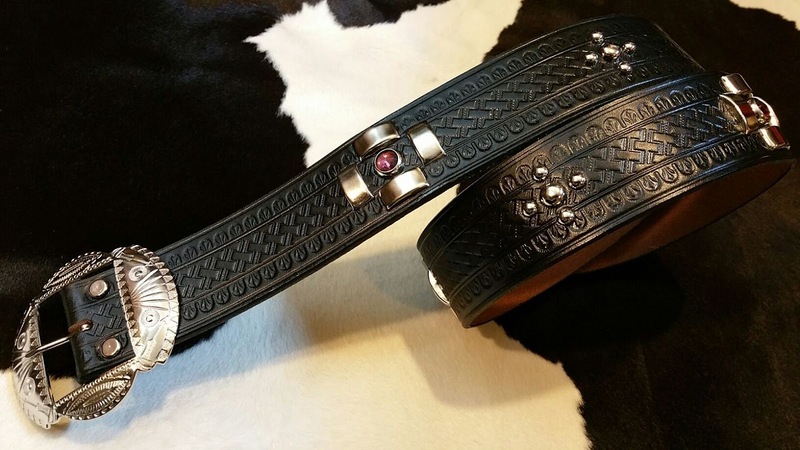 POD company is Pioneer of a DRESS BELT. 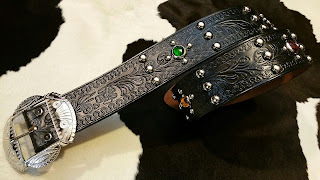 Preface, A studded belt referred to here is a dress belt that has had fashion emphasis. It's different from the strong work belt (cowboy gear) of a gun leather and saddle manufacturer of the Lawrence and the H.H.Heiser company and etc. 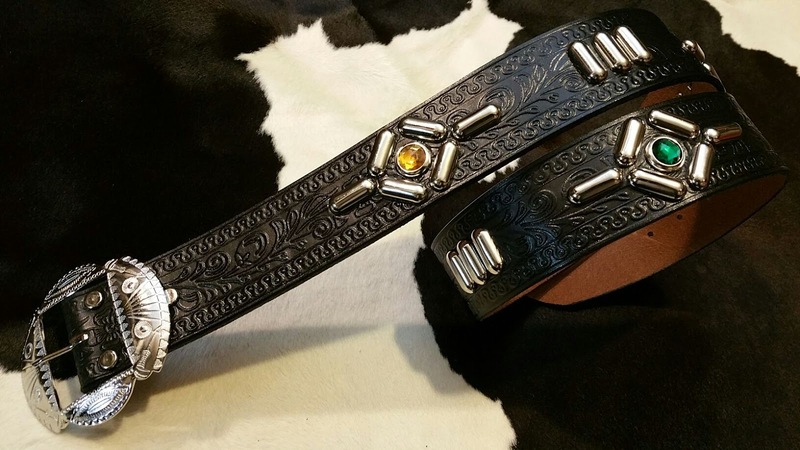 Stockman farmer supply company is a supplier of the DRESS BELT. And manufacture of the DRESS BELT is a POD company established in 1920's. 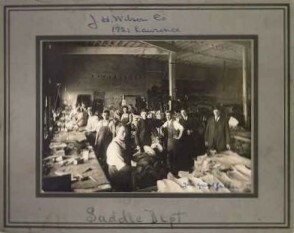 Also saddle maker established in 1870's is a forerunner of POD company. 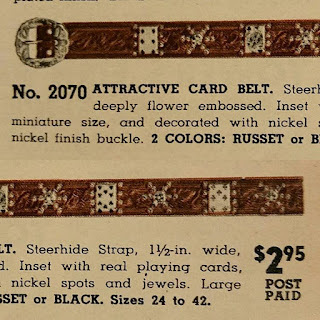 POD company specialized the DRESS BELT from the 1920's to the 1950's, was responding to the American various needs by novelty sense. 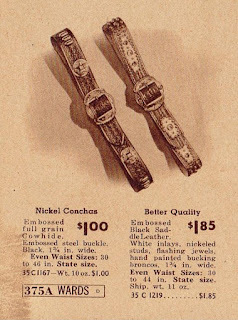 By the way, "Made in the west by expert" in Montgomery ward catalog has means a POD company. 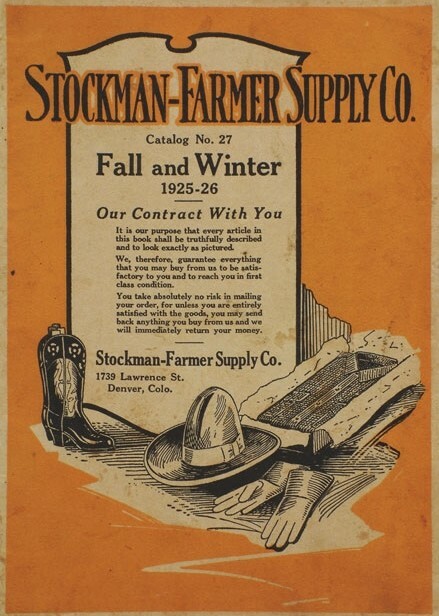 Also, Stockman Farmer Supply Company established in 1919. There were two companies in 1.5 mile distance. Two young companies which have started at an around the same time cooperate each other. 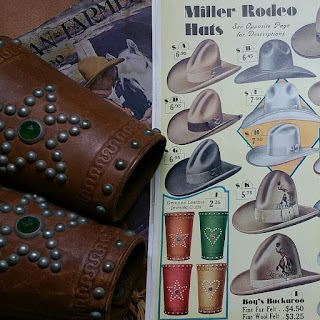 In 1918 Philip Miller traveled to the Great American West on the advice of his doctor, and to sell hats for his family’s New York City based Miller Bros. hat company. 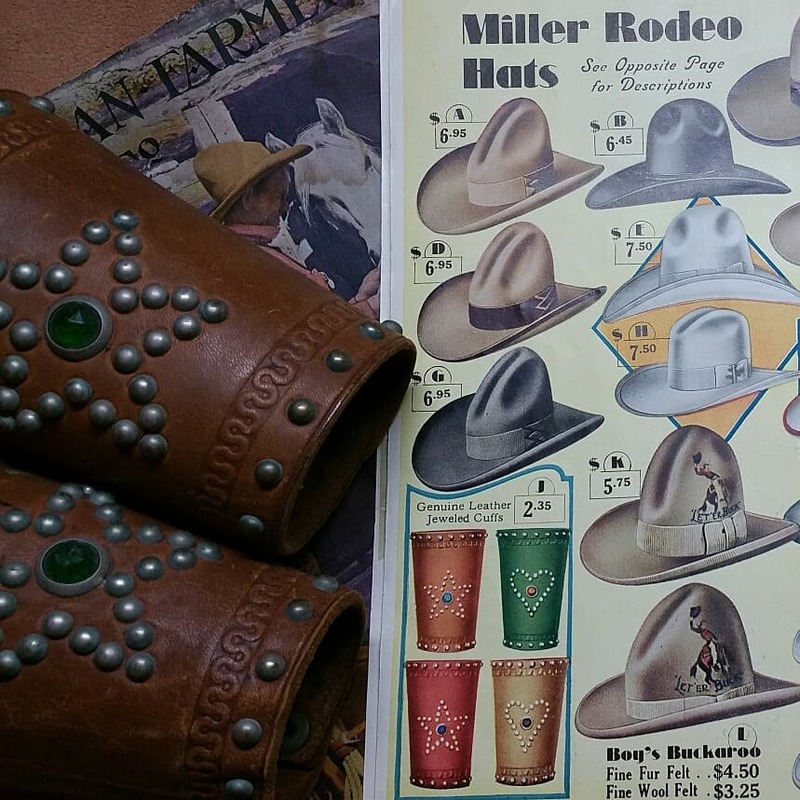 Phillip Miller’s temporary stint in Denver evolved into a much greater journey- a lifelong love of the West and the creation of a western wear business that survives to this day. As a traveling hat salesman, Phillip became close with the farmers, ranchers and rodeo cowboys that he met, and in addition to hats, began providing them with special items (DRESS BELT etc...) they would request. 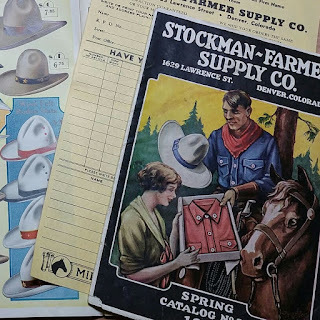 This experience provided the basis for the founding of his own Denver-based business, a mail order catalog originally operated as Stockman Farmer Supply Company. 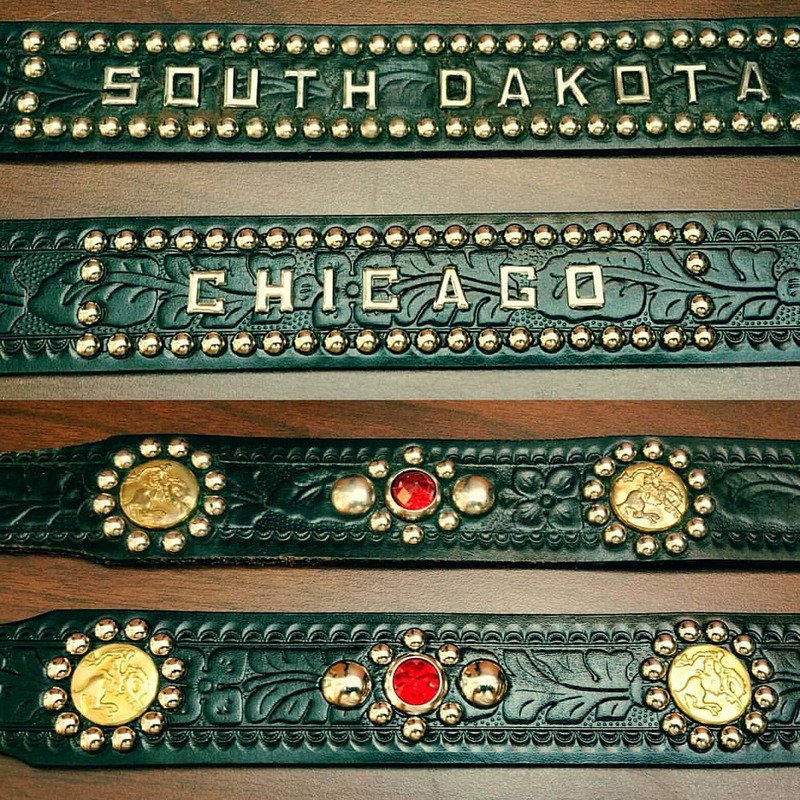 Originally the spot decorations were adopted to a harness and sporting goods. POD company installed the spots decoration to fashion, and made the DRESS BELT. 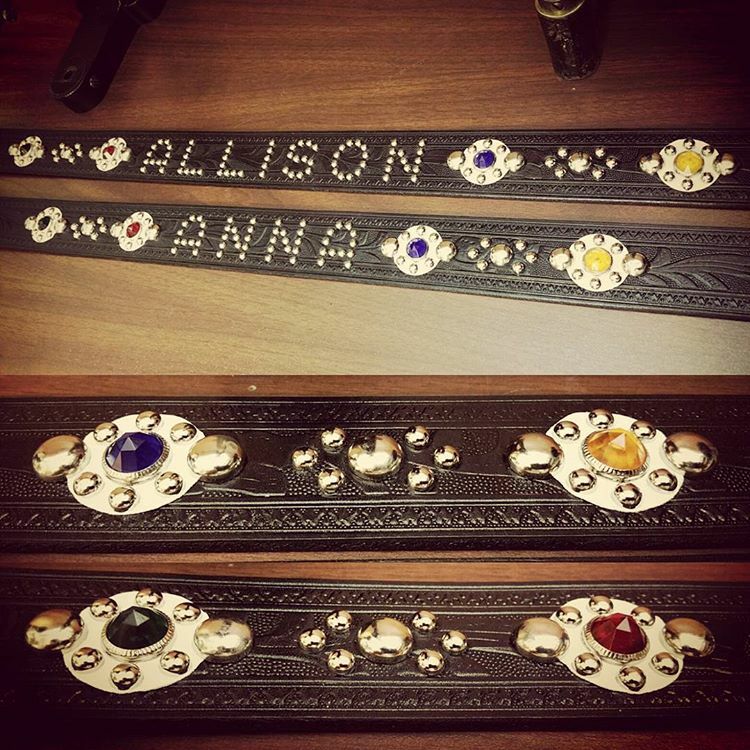 The DRESS BELT was very popular. A major mail order brand also begins to sell it from the mid 1930's, and more design is born. 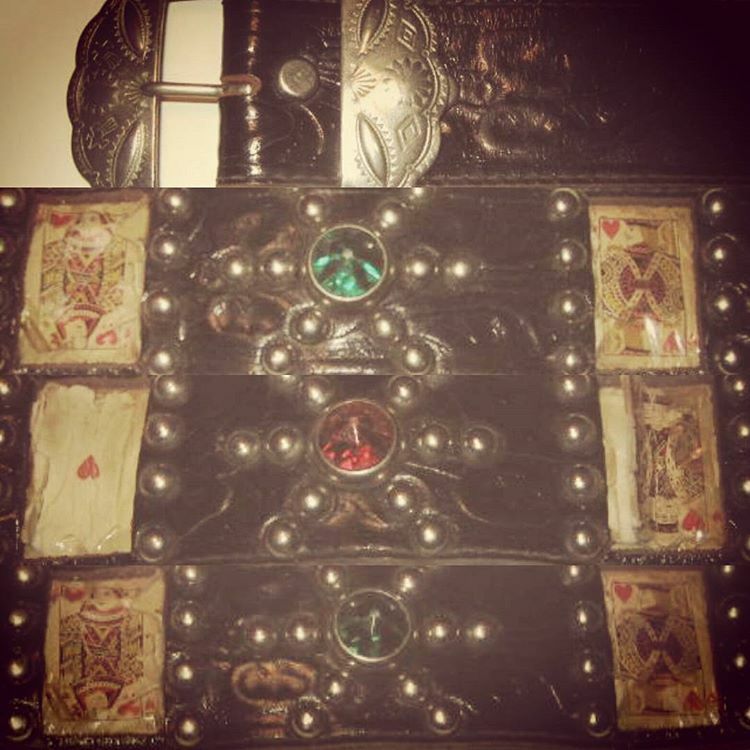 Inlay belt, Cutout belt, Card belt, and Picture belt are a planning of POD company. 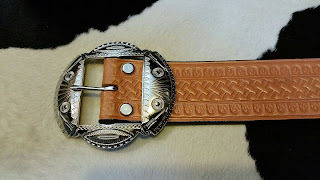 POD company is also planning the buckle and emboss design for the Western belt. 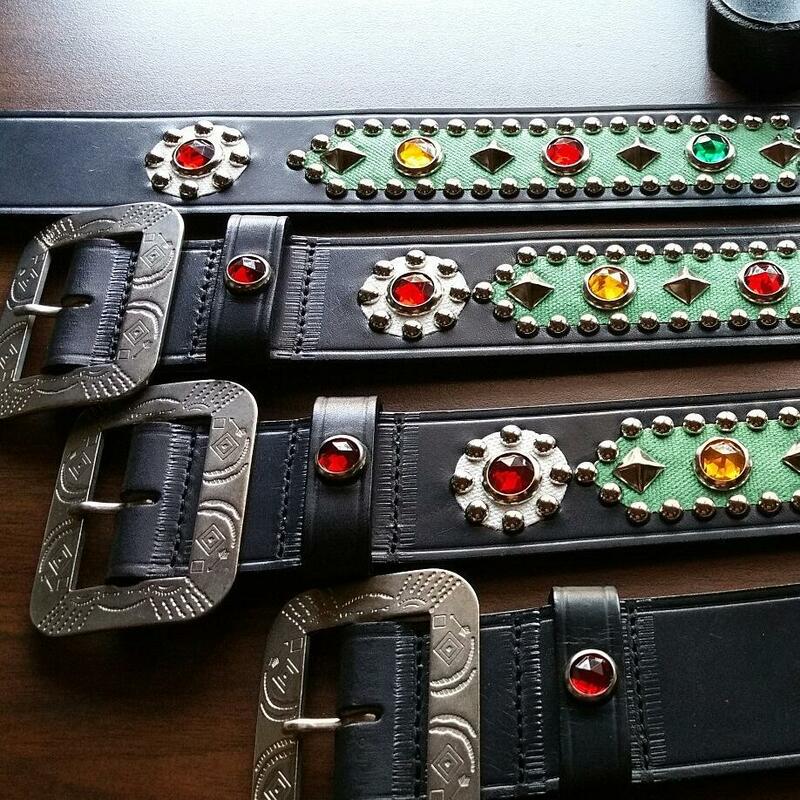 Also the flashy color belt (Orange and Green) was sold until in early 1930's. 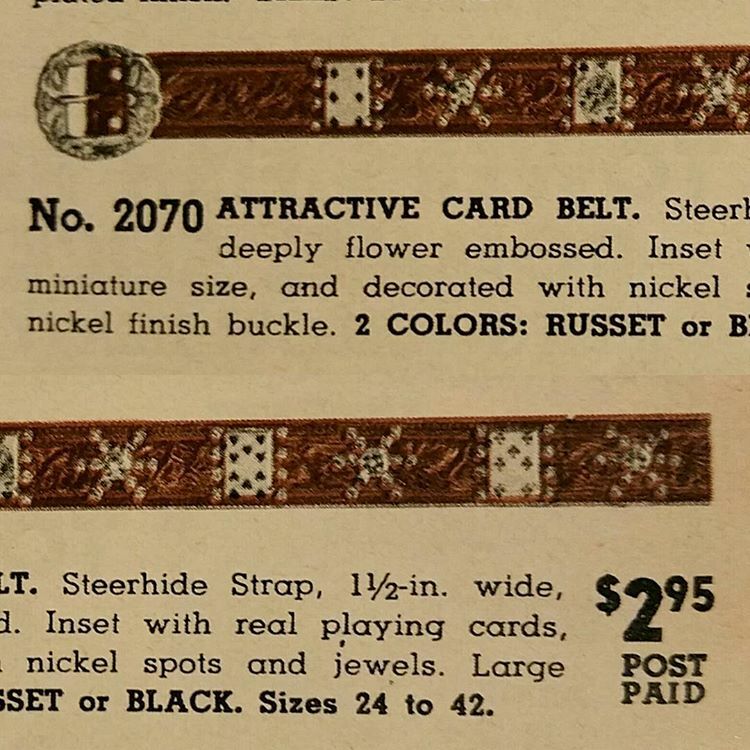 1930's No.955 card belt (No.2070 is removed) are an exclusive design by Stockman farmer supply company. 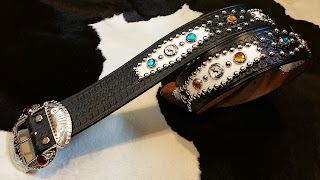 Rock Mount company sold the last DRESS BELT of POD company. 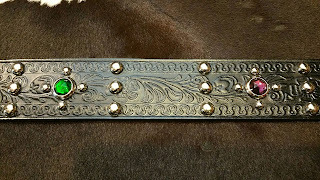 A component was exchanged for modern version, but the same technique as those days was adopted, and I was glad that tradition is taken over correctly. If you have a vintage DRESS BELT, please look once more. 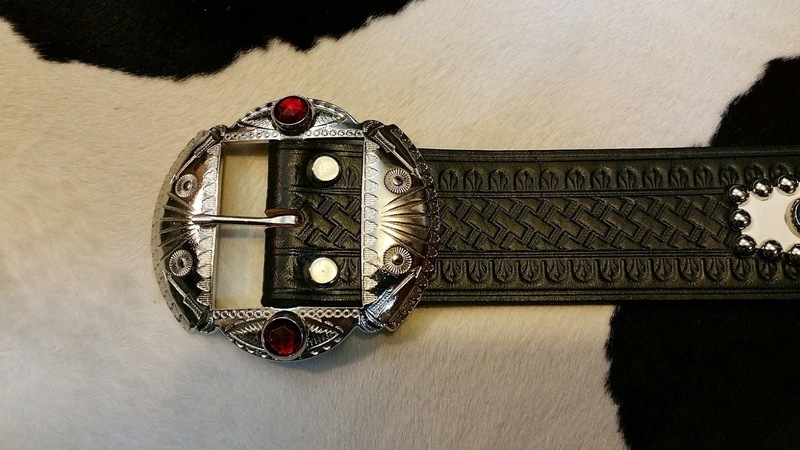 That is probably a belt with long history and tradition of POD company. Afterword, POD company brought down the curtain on its 135 years history in 2012. 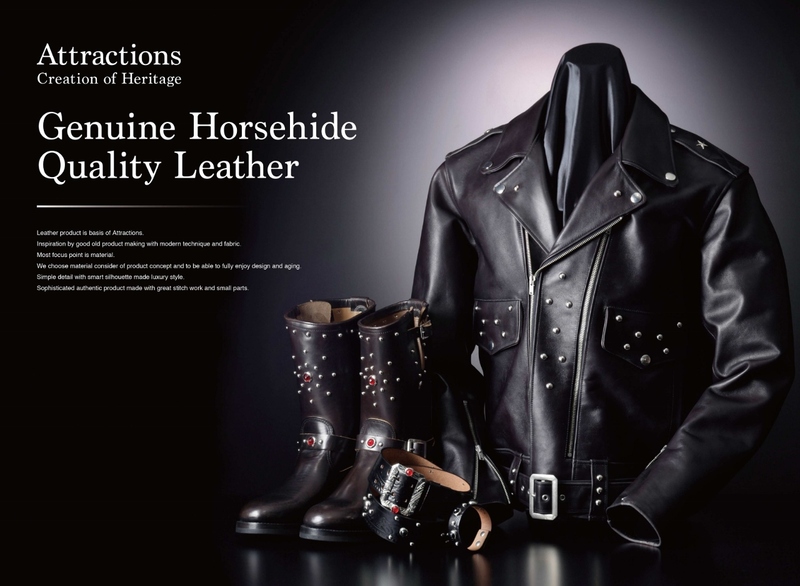 We have respected POD company's traditions to produce reproduction items. The unique characteristic of the Western golden age has not change despite the passing years. 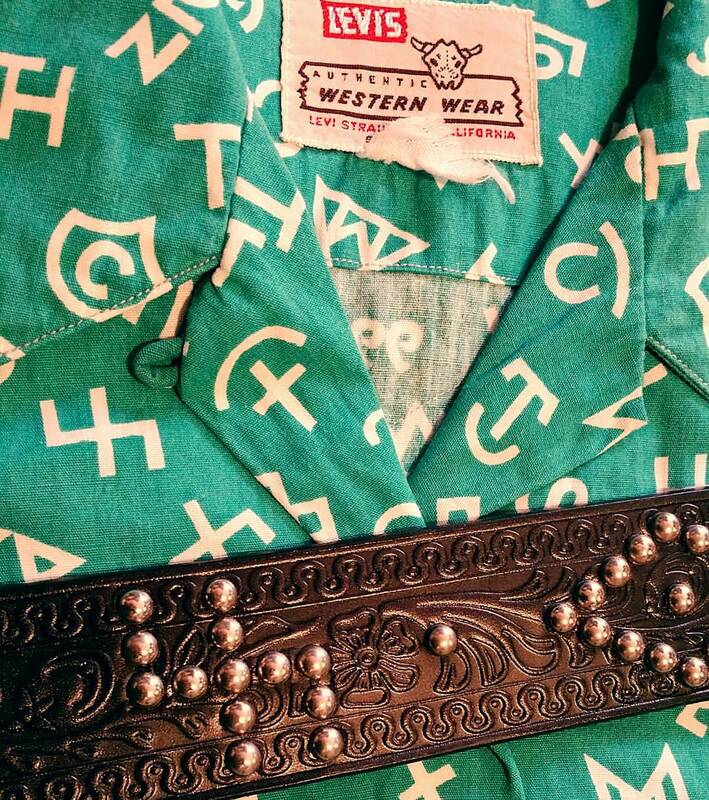 We want to capture this aspect of a DRESS BELT's tradition and transmit it to the fast-moving days of today. A reproduction of the 1930's model by Montgomery word. 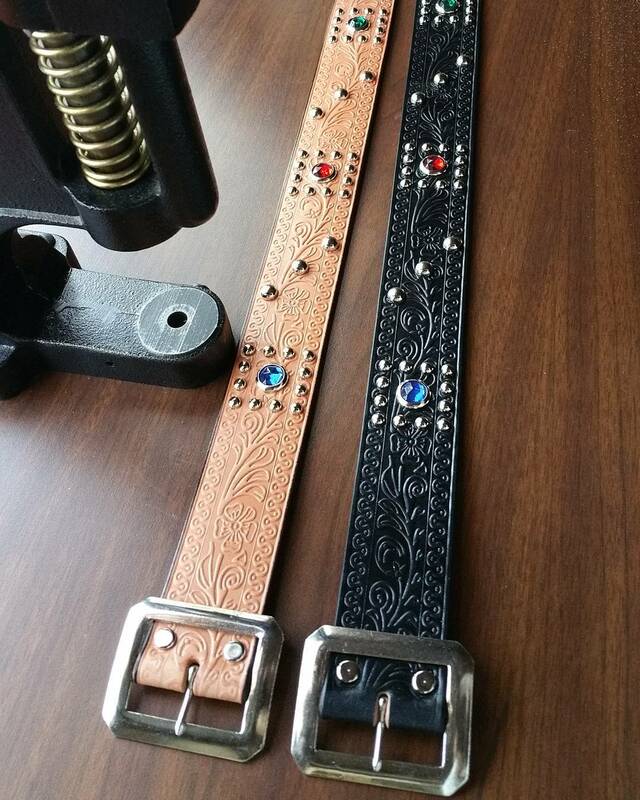 We reproduced the emboss and an inlay design in faithfully from the 1930's original belt. 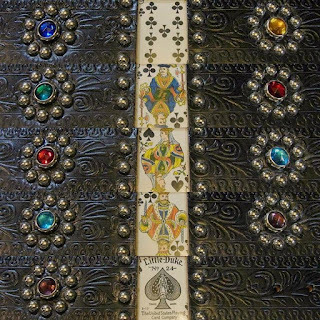 3-dimensional pictures spots and the face cut jewel which are the feature of this era are a genuine Czech glass. (face cut jewel of No.300 is acrylic) Jewel ring adopts the genuine old stock and the reproduction of classic style like a vintage. A reproduction of the 1930's model by Miller stockman. We reproduced the late 1930's emboss design in faithfully from the original belt. 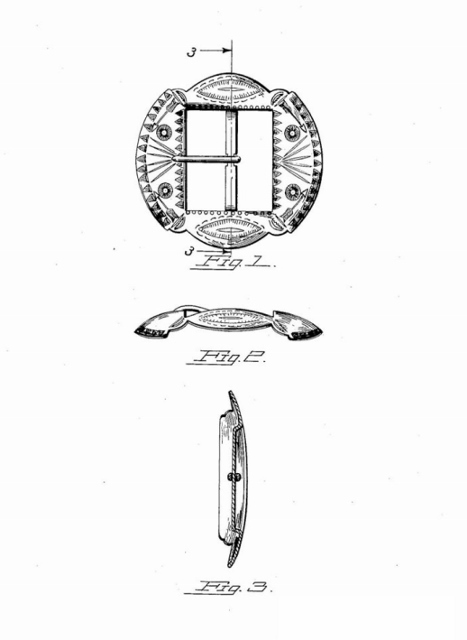 The face cut jewel which are the feature of this era are a genuine old stock glass. Jewel ring adopts the reproduction of classic style like a vintage. A reproduction of the 1930's model. 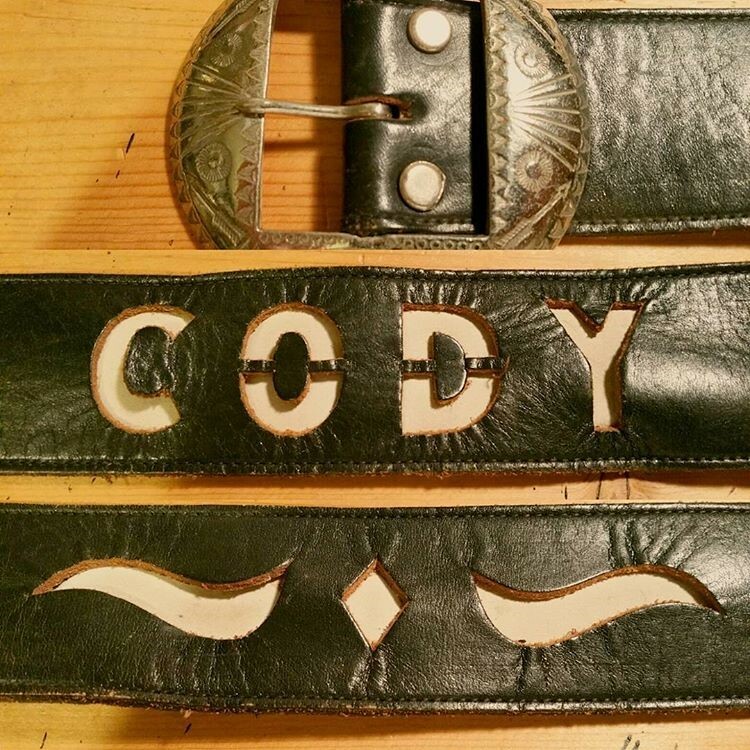 We reproduced the late 1930's emboss design in faithfully from the original belt. 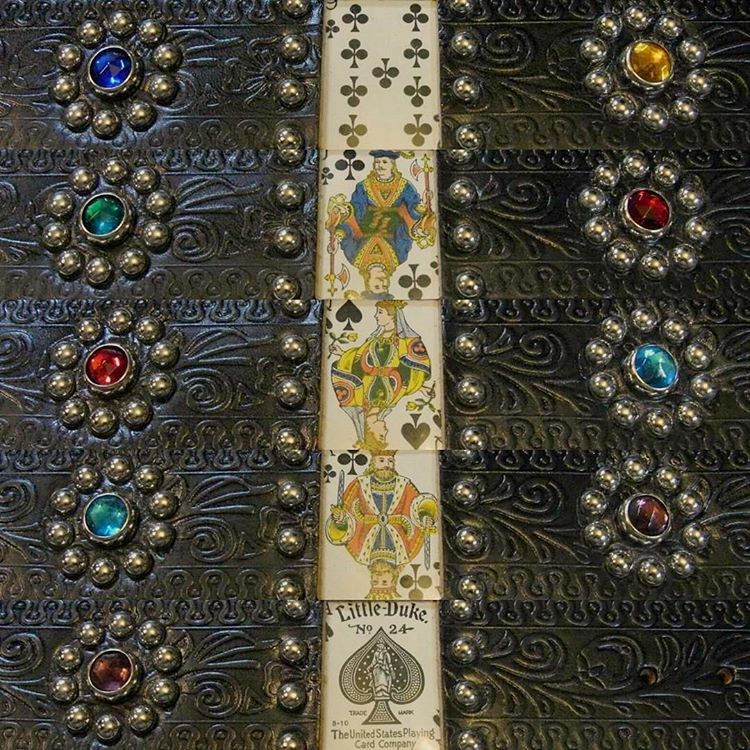 3-dimensional pictures spots which are the feature of this era are a genuine Czech glass. 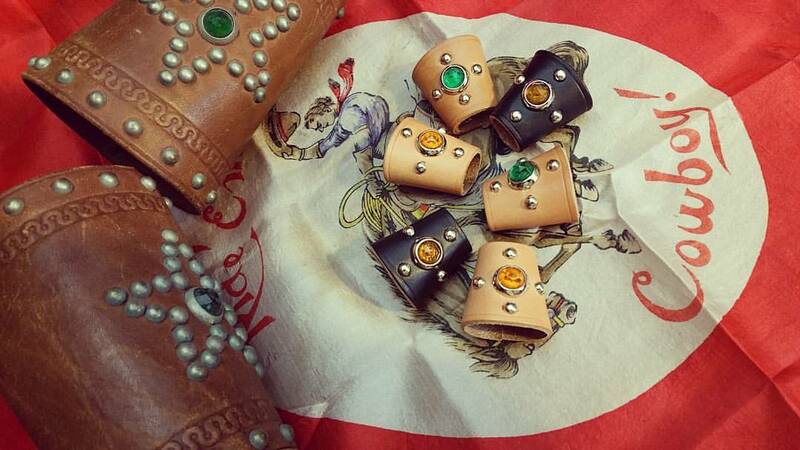 Jewel ring adopts the reproduction of classic style like a vintage. A reproduction of the 1930's model by SEARS. The derivation model of "BULLET series" born in 1935. 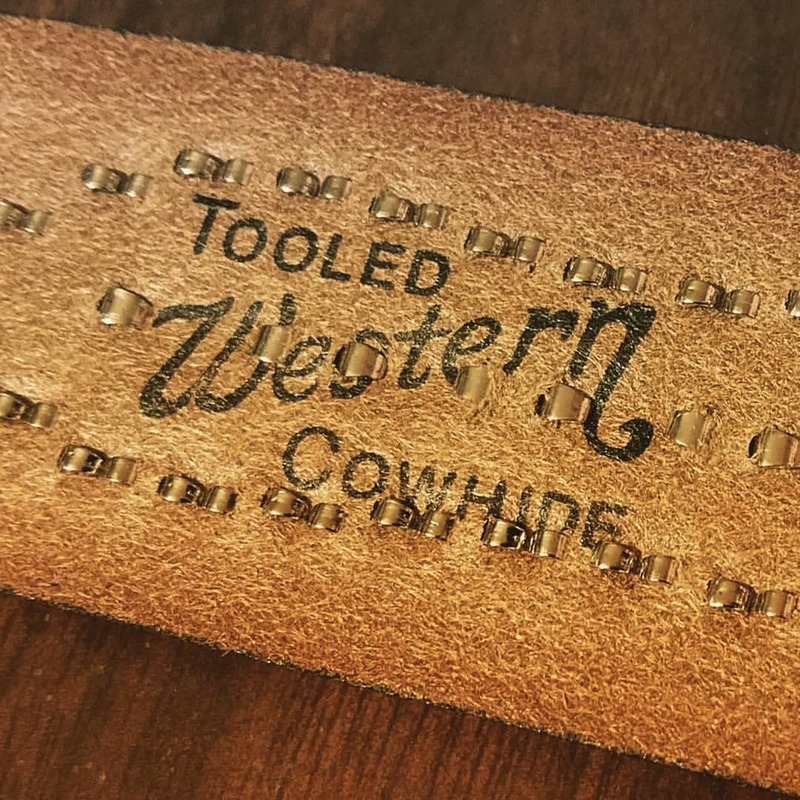 We reproduced the main emboss design in faithfully from the 1930's original belt. The face cut jewel which are the feature of this era are a genuine old stock glass. Jewel ring adopts the reproduction of classic style like a vintage. 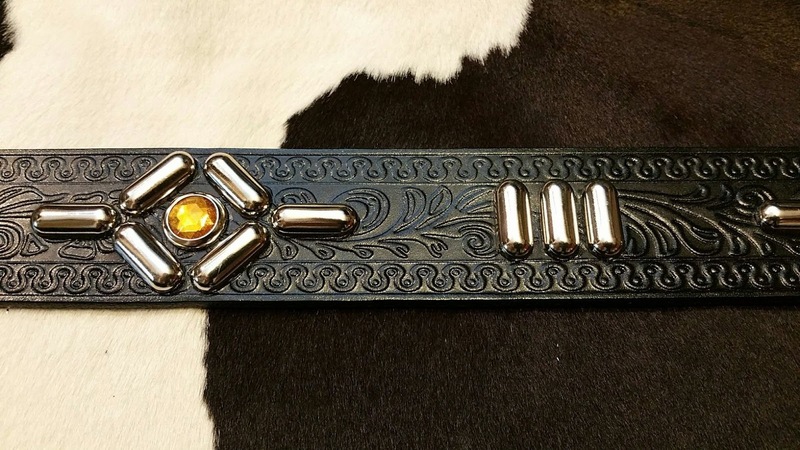 A reproduction of the 1930's model by Western Ranchman. 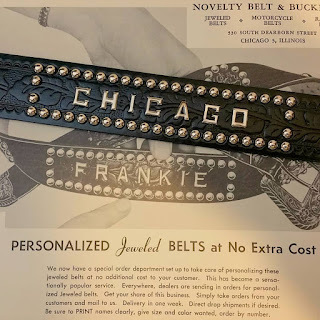 We reproduced the early 1930's emboss design in faithfully from the original belt. 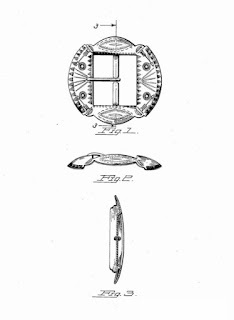 The face cut jewel which are the feature of this era are a genuine old stock glass. Jewel ring adopts the reproduction of classic style like a vintage. We are distinctive western belt manufacturer. We produce spots decoration belt specialized in "Americana of the Western golden age" in Japan. 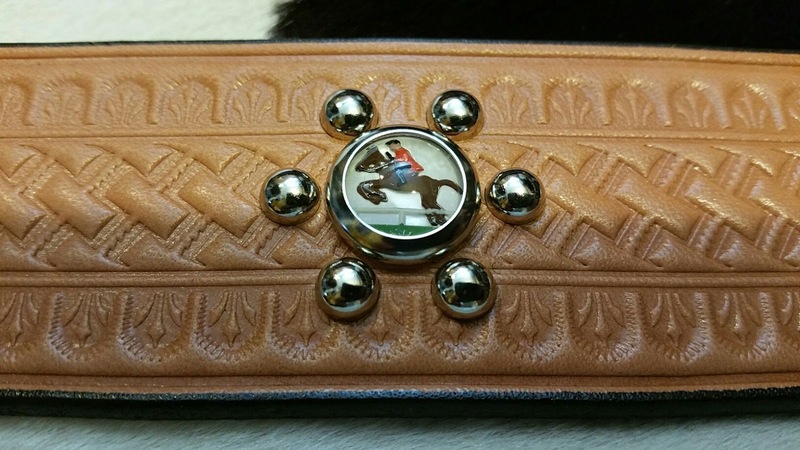 The product concept is "made in the heart of the west". 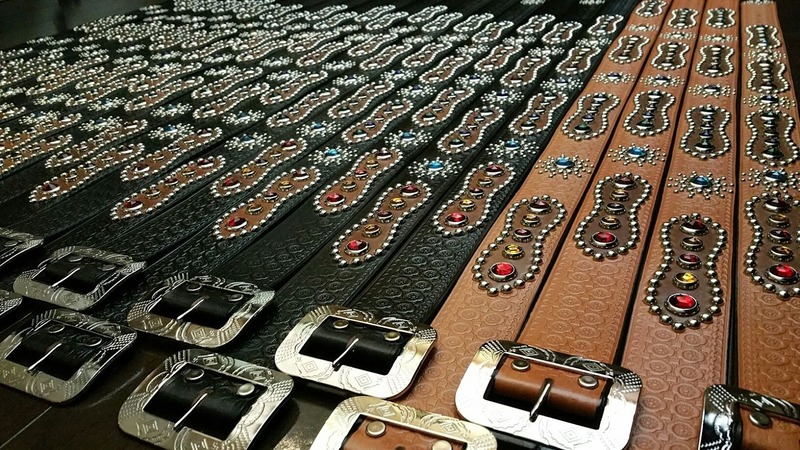 We are very particular about the parts and machine used for a belt, and developed relationships with the American company to obtain the best distinctive western belt. Since that time these company have closed and we have had to develop new relationships and this takes time and patience. 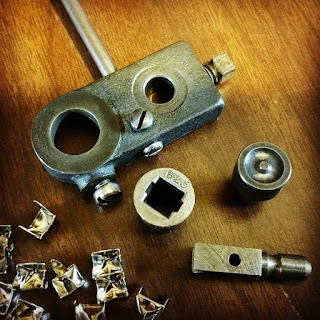 We are always on the lookout for new techniques and ideas that meet and exceed our customer expectations. We strive for the same quality and workmanship being used to make the tooled spotted and jeweled belts made since the 1930's. 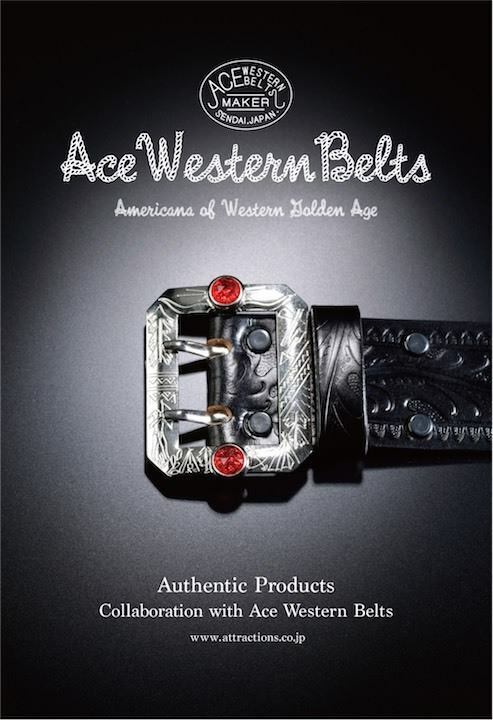 Our products is very nice new vintage reproduction designed in Americana of the Western golden age. We are always full of the feelings to make the products with atmosphere of prewar charming. 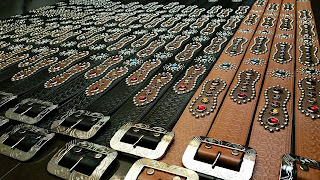 All belts are made in Sendai, Japan. Beyond doubt, ACE WESTERN BELTS are the finest vintage style belts money can buy. 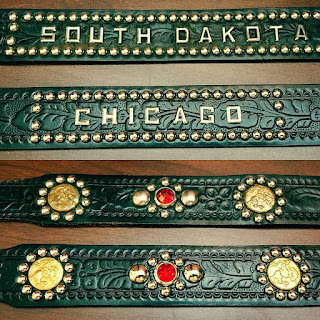 Each belt is painstakingly made to be as near as possible to the originals that were so popular from the early to mid 20th century.